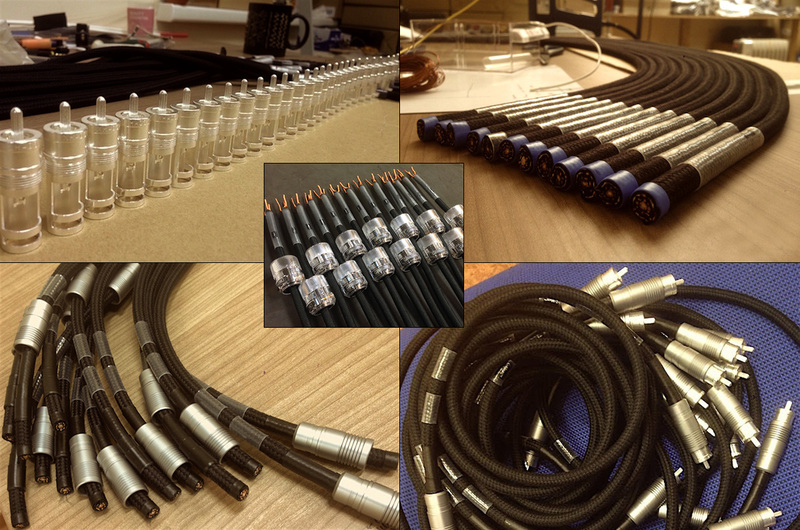 When potential buyer Glenn contacted LessLoss with an inquiry about using the C-MARC™ bulk Triaxial cable for DIY XLR interconnects, Louis thought that his reply could be of interest to our readers. "Yes, we use the Triax cable for our XLRs. Everything fits but you have to know what you are doing​. It requires expert preparation and tinning of the ends. This is a true Litz wire. You can't just solder it together. You must tin the ends first with a soldering pot and special liquid flux. It is extremely difficult to get right and insure that all individual strands made contact but that you didn't burn away copper in the process; and that you form the ends such that they fit into the contacts for soldering since the 2.3mm² cross section of all strands of one polarity will never fit. Preparing one ending can take a very well-trained individual with a lot of experience one hour. If you have the necessary equipment, I recommend getting more cable than you need and experiment on a test segment first. Once you have mastered it, make the actual interconnects. ​It may take you 3 or 4 tries until you have the strategy worked out. ​We use very thin cotton string and cyanoacrylate glue. The cotton fibre self-amalgamates in reaction to the glue, forming something akin to an epoxy-impregnated fibre laminate when it hardens. You do not want to inhale the fumes or make eye contact as they are highly corrosive. 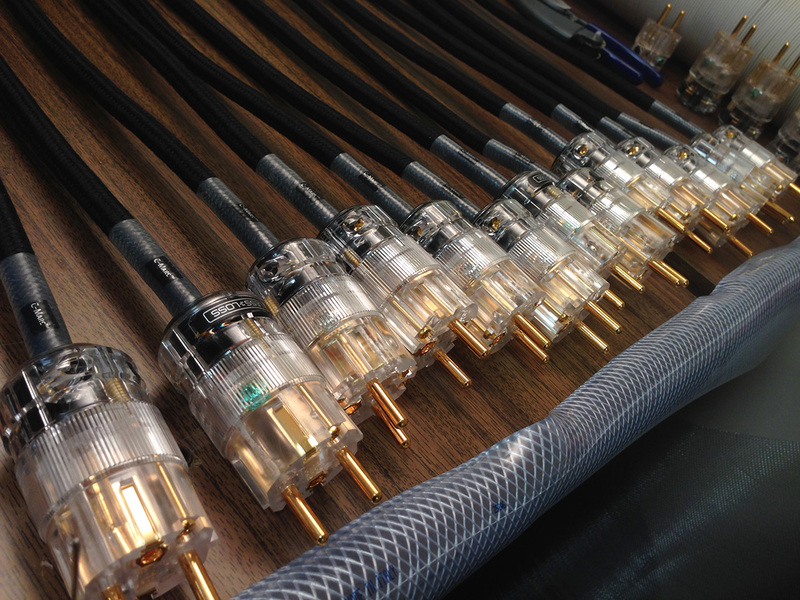 We use Neutrik gold-plated XLRs. Buy Neutrik's separately available oversize parts for cables up to 10mm in diameter, then further enlarge them ​by another 2mm ​so that our triaxial cable fits. Believe me, the type of connector has infinitely less importance on the sound with our wire. C-MARC is so advanced that even with standard connectors, its sound dwarfs basically any other cable. Its pitch-black background allows the sound to come through super pure, super detailed and super rich while the small Litz gauge makes for superb phase response across the entire bandwidth." Like their French/Canadian counterparts at Ocellia who continue the legacy of Bernard Salabert's PHY and with it, the concept of MDI or micro-discharge interface distortion, the LessLoss C-MARC shuns synthetics/plastic. Separator and sleeving of choice are mercerized cotton that's been dyed black. From Wikipedia, "that process goes back to the 1880s. John Mercer was granted a British Patent for his discovery that cotton and other fibers change character when subjected to caustic soda (NaOh, also known as sodium hydroxide or lye), sulfuric acid and/or other chemicals. Caustic soda caused the cotton fibres to swell, become round and straighten out. In 1890, Horace Lowe found that by applying Mercer’s caustic soda process to cotton yarn or fabric under tension, the fabric gained a high lustre by reflecting light off the smooth round surface the NaOH created. It became an overnight success and revolutionized the cotton industry." Because C-MARC runs no nylon spacers, tubes, plastic sleeves or thick solid-core conductors, it's highly flexible and easy to dress. No capsized lightweight components from bench-pressing stiff springy wires [click here for demo video]. In fact, the complete review loom spread across three UPS boxes only weighed 5.4kg including the packing materials. In my phone call to Lithuania, I learnt why LessLoss opted for translucent plug housings. It's not to show off the innards. "When you must deal with plastics as we do with the power connectors, the colorants used to make them opaque or solid have a negative influence on the sound. It's best to avoid them altogether and end up with a clear plastic". On whether the labour intensity of the C-MARC assembly felt dubious in hindsight, Louis explained how that's typical for any quality product. If it were about ease of manufacturability, we'd all have products made by robots. It might be very profitable but where's any artisanal satisfaction to be had from that? Louis not only enjoys the design but also crafting process. "Manufacturers mostly use brass connectors for their hardness and for retaining spring action reliably. The IEC C13/C14 connection requires that plug contacts have spring action to maintain and hold the connection. For our past flagship DFPC Reference power cord, we disassembled each Oyaide C-079 plug down to its bare bones to add hard rubber springs and apply more contact pressure than stock. This was audible with more immediacy, clarity and focus. With our new connectors, contact pressure is very much improved even over our modified Oyaide. These contacts now are 100% copper achieved by massively increasing their metal thickness over twice what's normal. You get very strong contact pressure and very good conductivity not only by using copper vs. brass but by using thick vs. thin. Double-check that what you think is plugged in is really fully plugged in. Be strong. The resultant sonics are worth the effort." 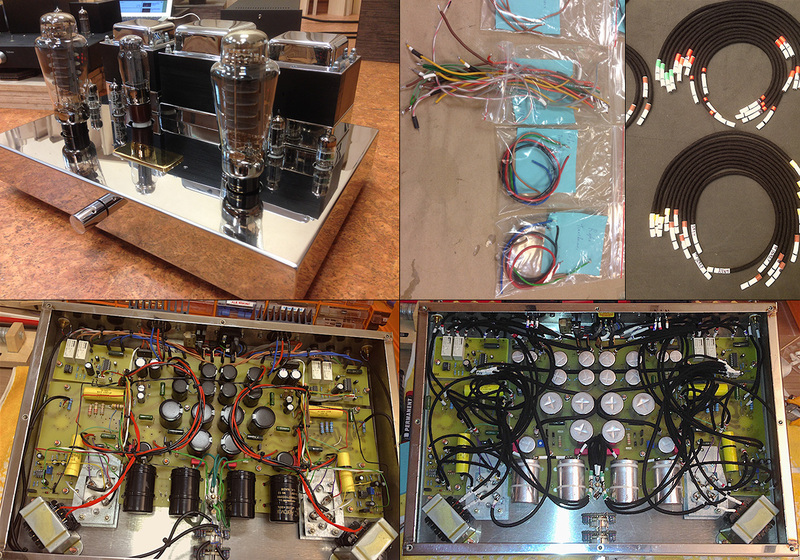 ... a second-hand Art Audio Jota valve amp for his personal enjoyment. Whilst at it, he naturally also denuded the capacitors and bypassed the volume control. He supplied these photos just in case others might get inspired.